Tours depart seven days a week. Warner Bros. 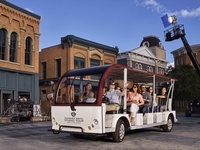 Studio Tour Hollywood brings you closer than ever to the legendary entertainment you know and love. Get ready to explore our iconic backlots, The Archive and The Picture Car Vault. Plus, you'll view one of our many soundstages where today?s hottest TV shows and movies are made. With actual filming happening all around you, no two tours are ever alike.